Back in January, I wrote about how a Chinese factory was producing inflatable chicken balloons that bore an odd resemblance to President Donald Trump. At the time, the factory denied that the balloon was intended to look like Trump, but the visual similarities were obvious. Apparently, the similarity was entirely intentional and the balloon was meant to lampoon the president. One of those balloons found its way to the United States, and it has now set up shop near the White House. The balloon's designer, Seattle artist Casey Latiolais, has the proper permits from both the Secret Service and the National Parks Service to display the 30-foot balloon. He said it was intended as a commentary that Trump is a weak, ineffective leader. Latiolais has dubbed the balloon "Chicken Don." As far as protests go, I'll award points to this one for creativity, legality, and safety. 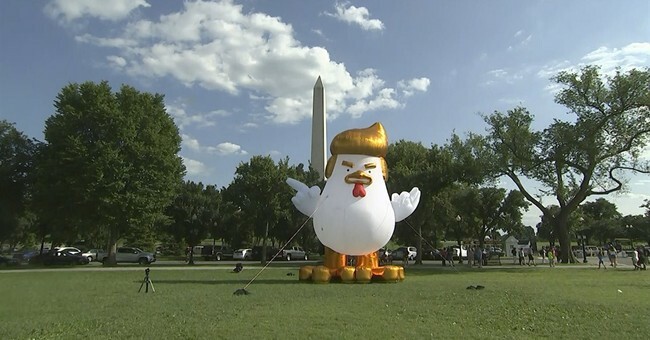 Nobody was physically injured, all permitting rules were followed, no property was destroyed, and it's always fun to see a giant chicken hovering near the president's house. But still, really? This is what the "resistance" is up to?